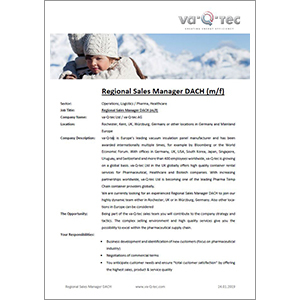 We are currently looking for an experienced Regional Sales Manager for the DACH region to join our highly dynamic team in either Rochester, UK or in Würzburg, Germany. Other locations in Europe can also be considered. Opportunity: To be a part of the va-Q-tec sales team and contribute to the company strategy and tactics. The complex selling environment and high quality services give you the possibility to excel within the pharmaceutical supply chain.